In September 2014 David Horner retired as a Principal Lecturer from the University of Brighton, having worked there since September 1992. He has held the position of Head of the Division of Information and Media Studies (2003 – 2007). He has served on many university and faculty committees including both Research Strategy Committee and Research Ethics Committee. He has supervised 10 PhD students and was for a number of years Research Student Division Leader for the School of Computing, Mathematics and Information Studies. 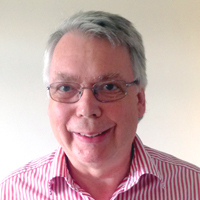 He has been also Course Leader for MA Information Studies (1998 – 2003). His research interests were primarily in the field of applied ethics: Information, Media and Computer Ethics. He has published many papers and given numerous conference presentations. He developed ‘film and philosophy’ as a specialism within Brighton’s media degree. David has developed and taught courses in media and communication ethics for over fifteen years at both undergraduate and postgraduate level. Since September 2015 he has been studying for an MA, by research, at the Faculty of Humanities, University of Exeter on the philosophy of mind.